You are right. 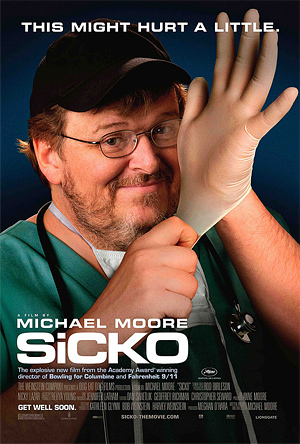 Michael Moore is so evil. How can this large man attack poor little defenseless corporate America like that? And taking sides with the global super-power Cuba is just, like, totally unacceptable. Do you think that compassionate conservative could exercise some of that compassion that he used in Texas and get Moore sent to the gas chamber? Wow. And that is why I come to this blog. Okay…I confess…I haven’t been here in a while. But you are brilliant. I don’t understand many things. But I do understand the need to get health care together. My husband now live in a society where health care is free…and it is just that…gross, take what you can-free. Everything a “free clinic” would be in your mind. There are blood stains on the carpet and sheets. They have charts on the walls to tell the nurses and volunteers what may or may not be wrong with you because all of the places you can go to like the “paid hospitals” actually have trained people who don’t need to look at a chart…they already know with out looking on the wall. And then you are sitting in plastic chairs for 7 hours just to be looked at to be told that you have pnamonia or TB. Yeah….I am all about figuring out this health care situation. But I think we need a better plan….because free health care is not the answer. At least not what we have seen. The health care system is broken. The decision making process is no longer in the hands of the physicians who care for the patients. Rather, it’s in the hands of accountants/risk managers who make life-saving decisions based on a ‘bottom line’ or ‘dollar-for-dollar’ return policy. HUH?? I work for an industry that absolutely banks on medical need. But the insurance industry has taken on a status of ‘above the norm’ in terms of values and ethics. If insurance companies don’t place the decision of critical care in the hands of respected physicians, they aren’t doing due justice to the patients who trust that their 10, 20, 50, 100, 1,000 dollars per month are worth spending!! Interesting discussion and points. Part of the problem that we have with solutions is that instead of passing the savings onto customers, they are returned to the “share holders”. Therefore, finding cost-saving solutions is a futile effort; look at the banking industry and the regulation of records–a consistent documentation trail, electronic records, and security protocols. All of those are designed to help reduce the costs of banking and improving information exchange. Instead, we’ve got a new bank on each of the three corners of an intersection where Walgreen’s was not able to build, worse service, and no faith in our bankers, who are no longer trying to help guide us through life with firm parental-like guidance, but with an eye on our pocketbook, not much different from a local petty thief. I think the answer is in raising he importance of values and ethics in our society. Look how over-the-top we’ve gone with social acceptance (to the point that if something is not OK with you, you’re labeled ‘prejudice’–it’s OK to be anything but not OK with some behaviors). If we can go that over-the-top with no ethics or values, perhaps we can do the same with honesty, integrity, and the idea of being a good neighbor to our citizens.